A quick thought experiment: Picture a jungle. This is how we might imagine five thousand years of human history — -a time of war, tyranny, and poverty. Now picture, within that jungle, a garden. This is how we might imagine the seventy years of post-World War II history — -a bubble in time in which a liberal world order has dominated. Today, with that liberal world order weakening, the jungle threatens to grow back and extinguish the garden. 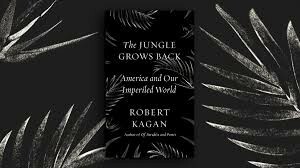 This is the thematic metaphor driving Robert Kagan in his latest book, “The Jungle Grows Back: America and Our Imperiled World.” His metaphor works in all ways: It aptly underscores the historical abnormality and precious value of a liberal world order — -an order in which democracy reigns, contrasted to strongman rule and abuse. The metaphor also underscores the peril posed to that order, not only by the recrudescence of strongman rule around the world, but by the retreat of the garden’s guarantor — -America — -which Kagan deems the truly indispensable nation. For those Americans anxious about today’s bigger picture — -who understand that it makes a world of difference what kind of power is dominant in the world — -this cogent 163-page book is a useful argument. Kagan, a conservative at the liberal think tank, the Brookings Institution, in this book (published in 2018) and in regular columns for The Washington Post, views Donald Trump and other anti-democratic rulers as both peril and symptom of late-breaking problems in the garden. Briskly, Kagan then describes the bubble most of his readers live in, wherein we take this liberal world order for granted: “We see all its flaws and wish it could be better, but it doesn’t occur to us that the more likely alternative to it would be much, much worse.” He gives historical context: “As children of the Enlightenment, we believe the expansion of knowledge and material progress goes hand in hand with improvements in human behavior and moral progress. From Montesquieu and Kant we learned that commerce tames the souls of men and nations, reducing conflict and increasing harmony and cooperation.” There’s more on the Enlightenment’s advances, an iteration Kagan leavens with the indisputable observation that, as to human behavior, there has been, alas, “no lasting improvement.” Elsewhere he comments on “the overall incompetence endemic to all human activity.” In other words, it’s the ideological framework, stupid, that has saved us. Kagan goes on: “The present world order has favored liberalism, democracy, and capitalism not only because they are right and better….but because the most powerful nation in the world since 1945 has been a liberal democratic capitalist nation.” In this, Kagan rightly connects the “right and better,” the moral raison d’etre, with the imperative that it must be backed with sufficient power, both military and economic. Shockingly, sadly, the United States is now included in this litany of bad actors. As Kagan writes, “a Counter-Enlightenment of surprising potency stirs in Moscow, Budapest, Beijing, Tehran, and Cairo, in parts of Western Europe, and even in the nation that saved liberalism seventy-five years ago.” This radical shift, of course, was signaled with the 2016 election of the anti-democratic Donald J. Trump. Going on, Kagan notes it was President Barack Obama who argued it was “time to focus on nation building here at home” when he announced a draw-down of troops in Afghanistan. In fact, the 2016 election was “the fourth presidential contest since the race between George W. Bush and Al Gore in 2000 in which the candidate promising to pursue a narrower definition of American interests and to reduce American involvement overseas” prevailed over candidates who stood for a more expansive foreign policy. With this book Kagan has issued that call to action, hoping to reverse the current “excessive pessimism”; he calls his own views pessimistic but not fatalistic. Skeptics and “realists” who doubt the value of the liberal world order would benefit from Kagan’s primer. This review reflects only the book’s first chapter, where Kagan lays out his argument in full. The rest of the book develops all the points cited: the jungle and its warring spheres of interest; WWI; the “derangement” of the international economy in the 1920s and ’30s; WWII and the establishment of the postwar liberal order, with a chapter on the “steep price” to Americans for that order; the Cold War and America’s missteps since “winning” it. Finally, two notes Kagan makes may point the way forward in this dark time. Both relate to the work of the architects of the post-World War II liberal order — -Franklin Roosevelt, Dean Acheson, George Marshall, George Kennan, Harry Truman. One: These architects, Kagan notes, were likewise realists, who, having survived two horrific world wars, held a dim view of history and human nature. Notwithstanding the establishment of the United Nations and the spirit of cooperation it promoted, these architects continued to view the world as an international jungle, wherein, Kagan writes, “such security as was possible….could be preserved only by meeting power with greater power.” In fact during the war, in 1943, FDR stated that if America did not “pull the fangs of the predatory animals of this world,” they would “multiply and grow in strength” and would “be at our throats again once more in a short generation.” It is a view — -the international sphere as raw power politics — -that Americans do not often consider. Not that the jungle cares. This reviewer, a liberal who protests current liberalism’s irresponsibility and licentiousness, could not agree more. My fellow Americans: Mind the jungle. For Robert Kagan’s columns for The Washington Post, see here. For other books by the author, see here. Full disclosure: I worked at the Brookings Institution 1972–76, where as a member of the Women’s Caucus I helped clear the jungle there to create better opportunities for women and minorities on staff.